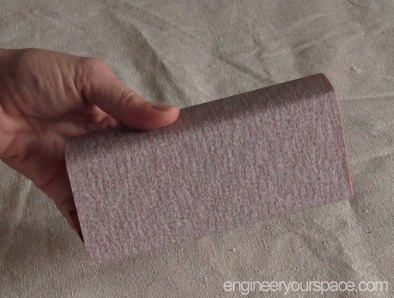 I’ve shown you a tip for mess-free drilling into walls using a post-it note to catch the dust in the past, but what about when you’re drilling into the ceiling? You don’t want all that dust to get on the floor or worse, in your eyes. 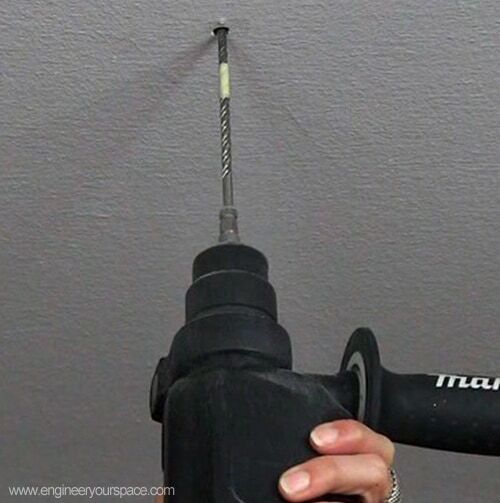 In my video Home Office Ideas, I shared a quick tip for drilling into ceilings: use a plastic cup to catch dust! 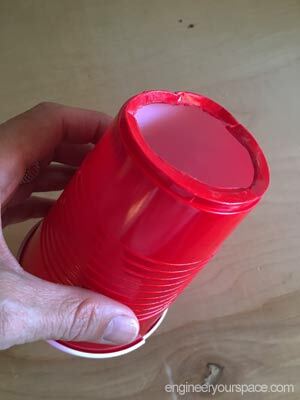 This is really easy to do: just cut a hole into the bottom of the cup wide enough to fit over the drill. Slide the cup over the drill, leaving enough room for the drill bit at the top. And the cup will catch all the dust while you drill your hole! And that’s it, now you have a sanding block that makes sanding so much easier, especially when you have a lot of sanding to do as I did when I made this bench for my dining room banquette! I’m always on the lookout for new products that might help me with my DIY projects and also work for rental apartments. So when I had the opportunity to attend the International Builders Show (IBS) in Las Vegas this week, I thought why not? The show is mainly for builders and contractors, but by meandering through the aisles with an open mind, I ended up discovering some amazing products. These have been around for a while but they were new to me. How I wish I had discovered them earlier! 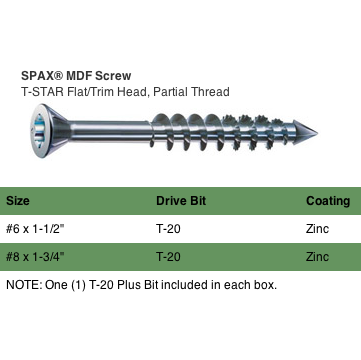 The SPAX product line includes MDF/wood screws that are just amazing: they don’t require pre-drilling to prevent splitting, AND the screw head can either stay flush with the material or countersink into it. I can’t wait to try these out on some of the projects I’m working on! 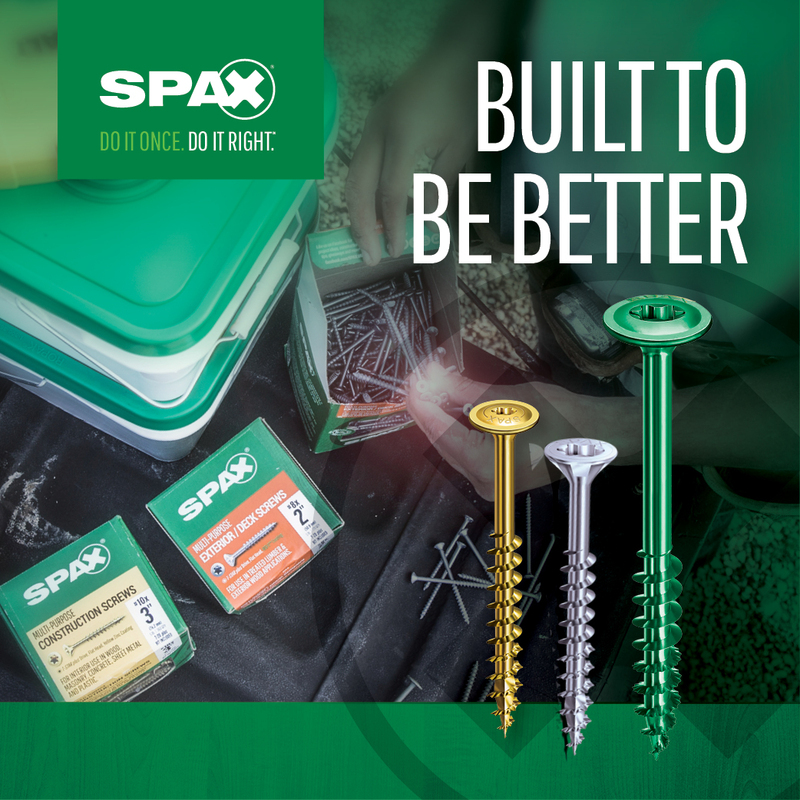 SPAX screws are currently available at hardware stores, including Home Depot, and online. If you’re like me and often work alone on DIY projects, it can be frustrating trying to get the end of the tape measure to stay put while taking measurements, especially if the surface the end of the tape is grabbing onto is round or slippery. Well, the new GripLine tape measure solves this problem – it is designed to catch, hold and measure multiple types of materials. 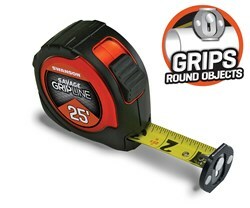 This tape measure was just launched last November so look for it in hardware stores soon. Lighting is a big challenge in rentals and I’m always searching for lighting products that can easily be integrated in a rental home without messing around with electrical wiring. 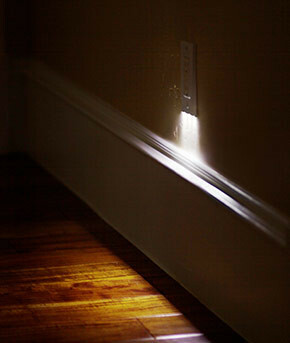 That’s why SnapRays caught my attention – it is essentially a nightlight incorporated into the faceplate of a electrical outlet. To install, you simply remove the existing cover plate, “snap” the SnapRays onto the outlet receptacle and the light will turn on when it gets dark. Perfect for rental homes! According to the manufacturer, the product will be available sometime in March 2014. Let me know what you think of these products in the comments below – which one are you most excited about? I often get asked what are my “must-have” tools, and looking back at some of the projects that I did and a few house calls I made recently to help out friends with some odd jobs, I found that I can get just about any job done with these 5 tools: 1. 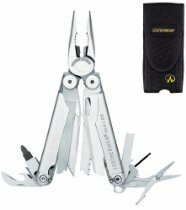 My multi-tool: If I could only have one tool, say on a deserted island, this would be it. In a pinch, it can act as a screwdriver, it can saw, it can transform into pliers, a can opener, a wire cutter, and the list goes on. Besides my drill, it is by far the tool I use most around the house. 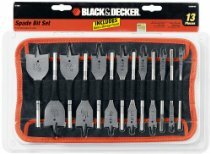 They come in many different sizes and combination of tools and they make a great gift too if you’re stumped on what to give someone – I’m pretty confident it won’t go unused! They come in many different sizes and combination of tools and they make a great gift too if you’re stumped on what to give someone – I’m pretty confident it won’t go unused! 2. My cordless drill and drill bits: My brother gave me this drill set for my birthday last year and I absolutely feel in love with it. 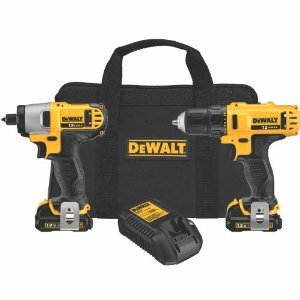 I love the compact and light design, which makes it very easy to handle, the spare battery is very handy to have on hand while working on a project, and having the storage bag is perfect to take my drill on my house calls! 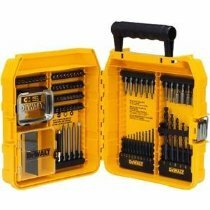 A must have with any drill is a complete set of drill bits, including a screw driving and fastening bits. I’ve also found lots of uses for spade bits and the hole saw bits. 3. 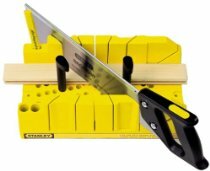 Mitre box and saw: I usually like to have my lumber cut at the hardware store but for those times when I need to cut something at home, I turn to my trusty mitre box and saw – it guides your saw so you can easily make 90 and 45 degree cuts. Not bad for something that costs less than $15! b) Quick-change quick-grip clamps – they are by far the easiest to use and the padding protects the surface of whatever it is you’re clamping. 5. 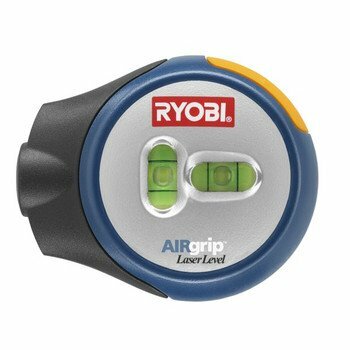 Hands-free laser level: This by far is my best friend when it comes to hanging anything on a wall, especially if I’m working alone. It will stick to walls, even ceilings, on it’s own, leaving my hands free to work. Love it! You really don’t need a workshop full of fancy power tools to get jobs done around your home, or to create and build amazing DIY creations. 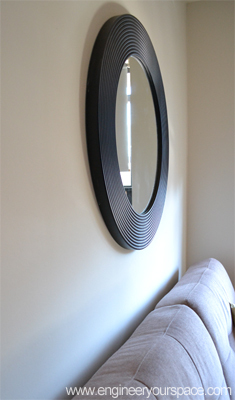 Pinterest is a great source for DIY tips and I was able to try one out recently that I thought was genius: using tape as a template to easily transfer the location of 2 holes on the back of a mirror I needed to hang. No need for a measuring tape! After marking the spot for the holes on the tape, I placed it on the wall at the height I wanted and used one of my favorite tools, a hands-free laser level, to make sure it was straight. Then before drilling, I taped a paper bag right under the hole to prevent the dust from falling on the floor – so much better than having to clean up all that dust! I removed the tape, put in the anchors and success on the first try! 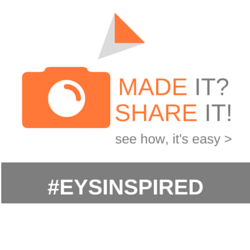 For more quick DIY tips I’ve compiled, check out my Pinterest board. So simple yet so brilliant: Designer Jung Soo Park found a way to improve a “run of the mill” hammer by incorporating a magnet at the end of the handle. 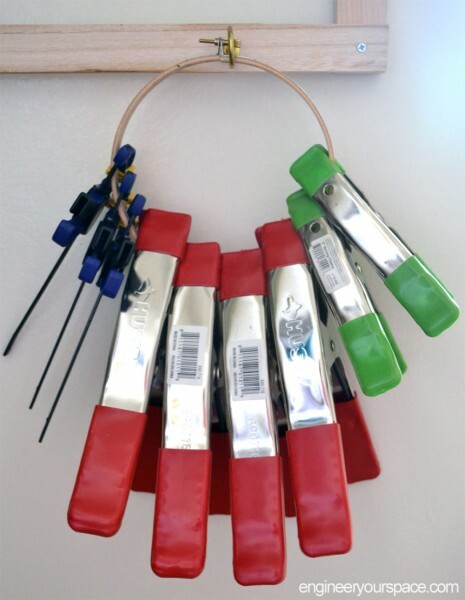 It holds a few nails while you’re working and if you drop a few on the floor, the magnet makes it easier to pick them up. 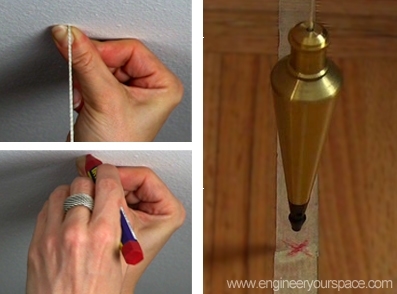 Make your own DIY version by simply gluing a magnet on the end of the handle. Works like a charm! Next time you want hang something from the ceiling, like a pendant lamp, use a plumb bob or plumb line. It’s essentially a pointy weight hung at the end of a string: you mark the floor or table with masking tape where you want the item to hang, let the plumb bob hang from the ceiling until the tip is right over the spot, then mark the ceiling where the string is. Now you know where to put in your anchor – low tech but it works every time! Need to drill to a certain depth? Use masking tape to mark off the desired depth on your drill bit – that way, you won’t overdo it! I used this trick to install a ceiling track system for a hanging room divider and it worked like a charm. 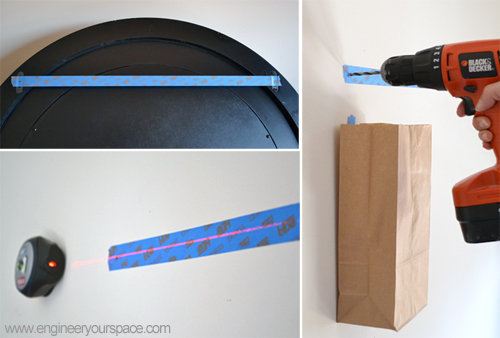 If you tend to do projects on your own, add a hands-free laser level to your toolbox. It’s like having an extra pair of hands when you’re working alone and they make hanging things straight a breeze. 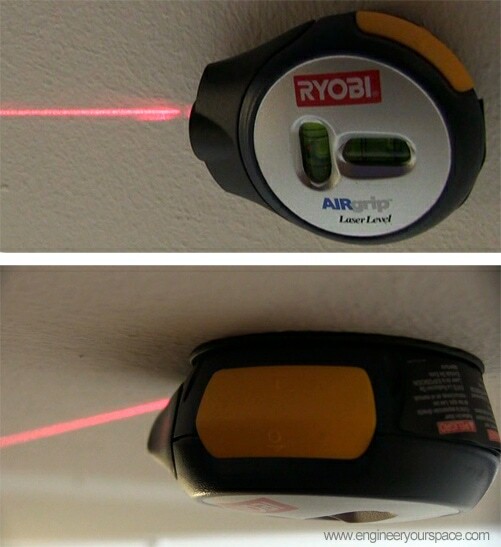 The laser level in the picture is actually on a ceiling, staying in place without using any adhesive. 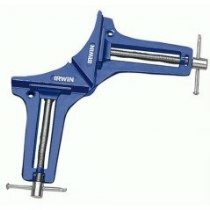 This tool also comes in very handy to install a hanging room divider. 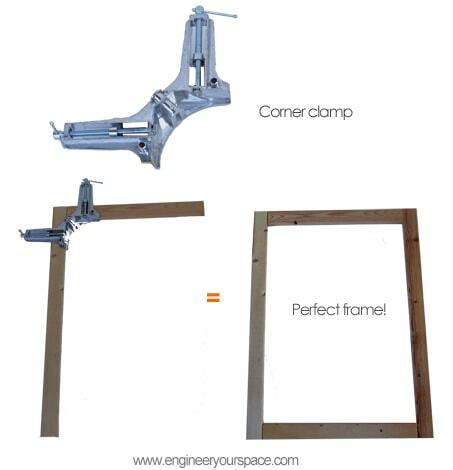 Making a frame perfectly straight with 90 degree angles isn’t easy without proper tools. The secret to making them perfect every time is using corner clamps: they hold the pieces in place at 90 degrees while you nail or screw them together. 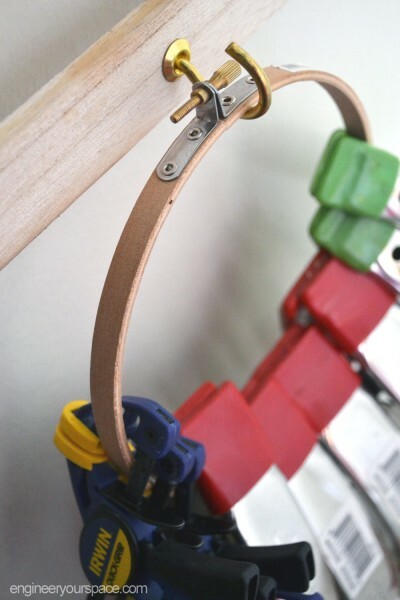 You can see how I used 3″ corner clamps to make a frame for my DIY hanging jewelry box. Once you see how simple it is to make a frame, you’ll just be looking for excuses to make them!